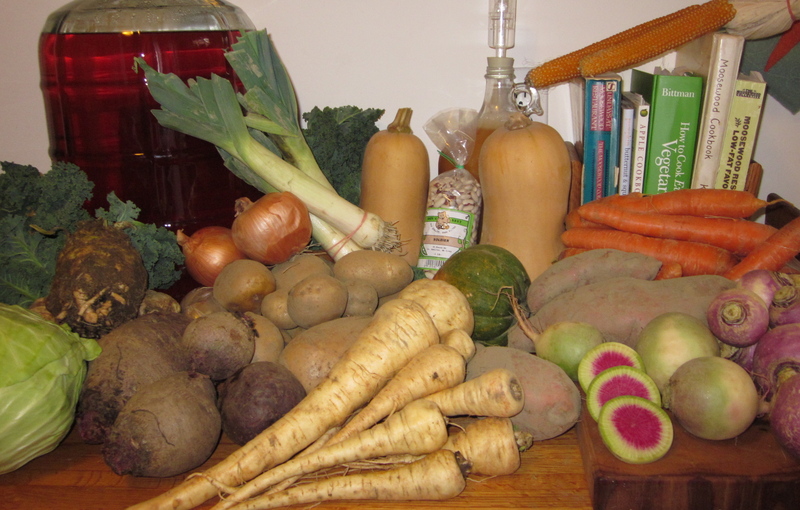 Saturday was the last distribution of Shared Harvest CSA’s three month winter share. Everything in the photo, except the cookbooks and brewing hard cider, was in the share. Here are the details. Butternut, 7 pounds (2-3 pieces) and ‘bonus’ squash – acorn in this share. White potatoes, 6 pounds. One pound of these potatoes was packed with the celeriac. Celeriac, 2-2.5 pounds (it is small! the drought this summer really took a toll on the celeriac!) Here’s a picture of celeriac, along with a nice recipe for it. Popcorn, 1 bouquet. Tips from Rob Lynch, Riverland Farm, on how to pop popcorn. Winter radishes, 1 pound. 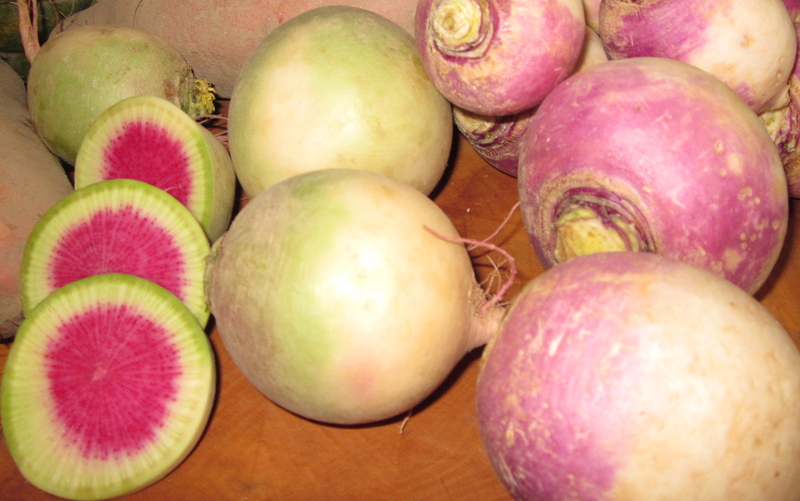 The radishes in the share were watermelon radishes. I think there might have been a few black Spanish winter radishes in some of the shares. The links have photos of the radishes as well as recipes. Baer’s Best Beans, one pound. Lettuce, three heads OR two bags of kale & carrots. Dennis Busa grew lettuce in his greenhouse. We’d hoped to be able to harvest kale, but the temps didn’t get above freezing on Friday, and veggies harvested frozen have zero shelf life. The last twenty Lexington shareholders got the kale & carrots from Brookwood Farm, as did all shareholders who picked up in Canton. The extremely cold temps in Canton last week did in some of the December greens, so the Brookwood crew substituted with carrots they dug on Friday.